The Potala Palace, a UNESCO World Heritage Site in the Tibet Autonomous Region, is a historic location with impressive architecture. But every year the palace takes on a new look, with the autumn and winter seasons bringing new color to its walls. This tradition can be traced back 300 years. Winter may not be the perfect season for visiting the Tibet Autonomous Region, but if you do, you may have the chance to see how the Potala Palace, a masterpiece of traditional Tibetan architecture, is taking on a fresh face through its annual repainting process. Rising from Red Mountain in the center of the Lhasa Valley, the Potala Palace has been a symbol of Tibetan Buddhism since the seventh century. 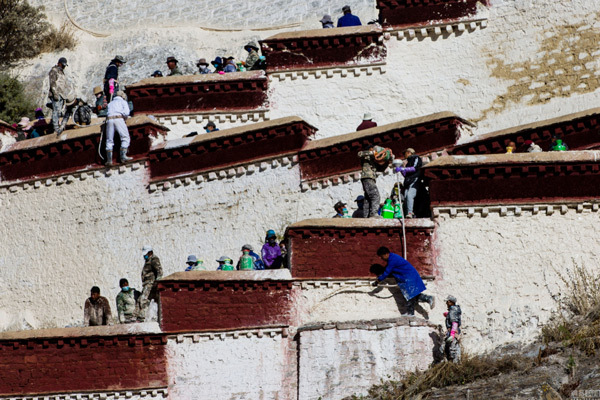 The sloping walls of the White, Red and Yellow Palace are painted in preparation for “Lhabab Duchen,” which falls on November 20 this year. Lhabab Duchen is believed to be the day the Buddha descended from heaven. And, the day is one of four annual festivals commemorating important events in the Buddha’s life. For this year, the painting schedule has been moved up about 10 days. Every year the Palace takes on a new look, with the autumn and winter seasons bringing new color to its walls. “Why the change in schedule? Basically, it’s because the weather recently is rather cold. We are afraid that our craft will be affected if the temperature drops below zero degree. After being frozen, the surface will crack up when the sun comes out. 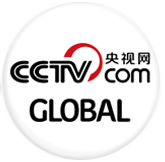 So advancing the schedule is mainly for the beauty of painting,” said Dawa, chief of Digital Center, Potala Palace. It will take about a month for the workers and believers to paint the palace. Painting buildings on a regular basis is common and a necessary protection against extreme weather conditions. Before Lhabab Duchen, many monasteries and local people’s homes were also repainted. “Ancient structures are built from the earth, stone and wood. If we paint it well, the cracks among the stones, if there are any, will be covered. Once the cracks are covered, the paint will serve as protection from rainwater, which in turn protects the architecture,” Dawa said. The repainted complex is a spectacular combination of beauty and originality, adding to its historical and cultural value. The Potala Palace was inscribed to the UNESCO World Heritage List in 1994. It received more than 900,000 visitors last year.